Objective:To evaluate the educational strategies and experiences of residency programs regarding the training of primary care providers in the care of patients who have AIDS. Setting:Survey conducted November 1988–April 1989. Participants:All 771 non-military U.S. internal medicine and family medicine program directors were surveyed; 80% responded. Measurements and main results:While 91% of the directors felt that primary care of AIDS patients was an important educational experience and 94% reported that their programs usually had AIDS inpatients, only 16% reported that the majority of trainees cared for AIDS patients in their continuity clinics. Even at programs that typically had six or more AIDS inpatients, only 26% of directors reported that most residents had cared for an AIDS patient in their continuity clinics. Among the 57% who did not believe or were unsure whether their residents were adequately trained in AIDS ambulatory care, only 38% reported improving resident education in this area to be a high priority. Among the 39% who did not encourage residents’ assumption of primary care, 60% had at least one of the following concerns: AIDS care too stressful for residents (24%), AIDS care too complicated for generalists (31%), or clinic faculty not qualified to supervise residents’ caring for AIDS patients (39%). 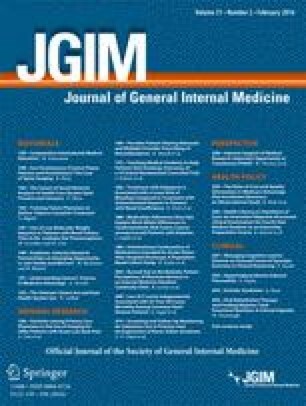 Conclusion:Although program directors view education in AIDS ambulatory care as important, most do not believe that residents are adequately trained, many do not encourage residents’ assumption of primary care of AIDS patients, and residents usually have not provided such care in their programs. Strategies to augment residents’ ambulatory experience in AIDS care are needed. Presented at the annual meeting of the Society of General Internal Medicine, Arlington, Virginia, April 28, 1989. Supported in part by grants from the Lyle C. Roll Memorial Fund and the Robert Wood Johnson Foundation. The opinions, conclusions, and proposals herein are those of the authors and do not necessarily represent the views of the Robert Wood Johnson Foundation.